Maybe Snowshill Manor at Kilsby ? What if I were to do a Snowshill Manor approach to de-cluttering at our home in Kilsby ? We would not have to buy more stuff, just rearrange all the clutter into collections in each of the rooms in our house. The previously troubling ‘clutter’ could thereafter be referred to as ‘precious artefacts’. The small bedroom that used to be Tom’s could be renamed the Pants and Vests Fashion Collection. My extensive Christmas annual gifts all pegged out on rotary clothes lines and clothes horses. The long Johns might have to hang on one of those retracting poles that lifts up to the ceiling. My Calvin Kleins could be at the forefront, or should that be Y-front. Later, I would be able to buy some string vests to add to the collection. I am sure this would become a most popular display to visit, when we eventually donate the house to the National Trust. The main lounge could be turned into the Cushion and Teddy Bear Collection. We might just about be able to get all the cushions in one room. Then the teddy bears could bounce around on them all day. We could even occasionally hire out the lounge as a playpen for children’s birthday parties. That would be fun. The study could be our new Museum of Modern Art Gallery. It would contain all of my uncle’s miniature wooden boxes, which are genuinely works of art. All of my own unique wood turned sculptures which are waiting to be preserved for the nation. Then we come to all of Tom’s childhood drawings which are currently in a plastic box under his bed. He assures me that it’s just a matter of time before they are worth a fortune. Last, but certainly not least, we could include Mo’s ceramic sculptures and tiles and pheasants and pigs and dogs and cockerels and angels. She will soon have a Noah’s Ark full. The kitchen could be taken over as a Whisky and Wine Cellar . It could house my vast collection of Malt Whisky’s and our racks of red and white wine. We might as well put in all the other bottles around the house, providing of course we don’t get mixed up with all the bottles of cleaning fluid and medication. The front hall could become the Junk Mail Room. We wouldn’t need to open the post, we could leave it to pile up under the letter box for years. No need to answer it or throw it away. Better stop the newspaper deliveries though. The man from Snowshill Manor – Mr Charles Paget Wade, eventually had to move out of his manor house into an adjoining barn and outbuildings because his collecting outgrew his accommodation. Like him, Mo and I could move into the old coal shed and live on the garden furniture that is stored in there. The shed next door has a copper boiler which Mo could use to do the laundry and we have several old cast-iron irons which she could use to iron all my shirts. Not too far down the garden path is the old privy and I should be able to find a tin bath on the Daventry tip. This might be a very good way of more efficiently using our house to house all our clutter —– oops I mean —- precious artefacts. 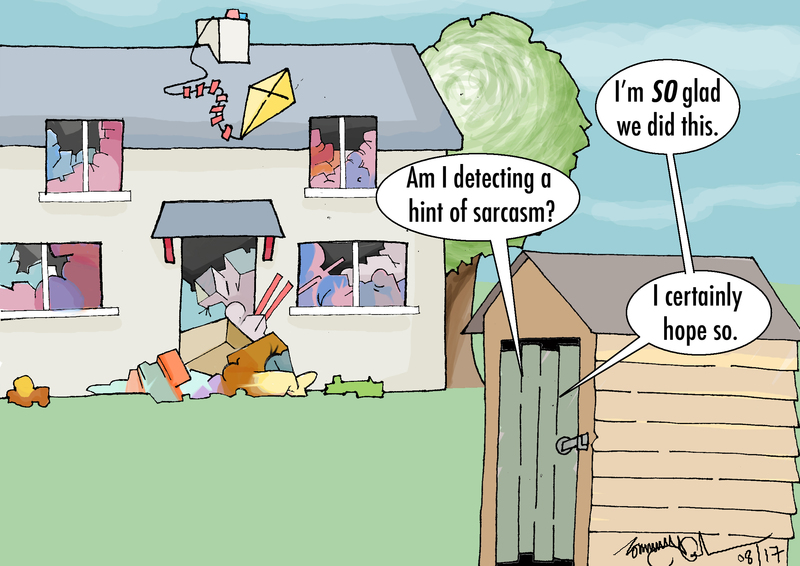 Living in the garden shed would be a bit of a sacrifice, especially in the winter, but it may be a price we have to pay for our place in history. I’ll write to the National Trust tomorrow! 3 Responses to Maybe Snowshill Manor at Kilsby ? Your plan has one fatal flaw John. You know I never go in to any of the garden sheds – they’re full of giant spiders and other nasty creepy crawlies. Recreate Snowhill Manor in the main house and go and live in the garden sheds if you wish. I’ll buy myself a nice little modern bungalow with the divorce settlement (and fill it with as many cushions as my heart desires 😘) !!! Ah! yes you old foggies? move into the ‘netty’ and pass wind, your a pair of ‘OLD FARTS’? But our old farts, please do not change just yet? Winter is on its was and you may need each oth to cuddle up to to keep warm! John you reminise, was the Snowshill Manor chappie happy with his MO, or was he all alone? Be greatful of what one has? Clutter is pure memories but plesent ones I trust? as to the National trust you are enough of a monument? bend a litle and become human: FART Now and again: It is all in the wind??? What a day; what a pleasent aroma? Happiness, it is like a rainbow forever seen and forever persued.for that ‘crock of gold’? Go on, I need to kiss the ‘blarney stone? not you you old chap, I just wish to shake your hand and wish you and Mo well. excuse the spelling:please. I rust you get the sense!